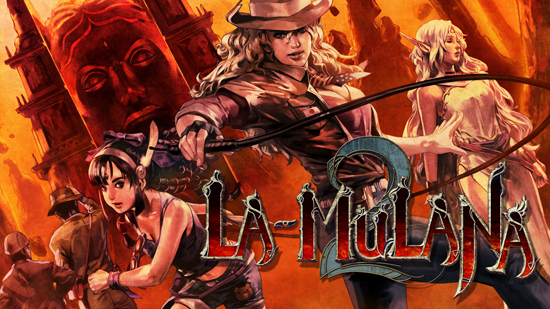 La-Mulana 2 is a sequel to La-Mulana, a hit release that sold over 500,000 copies. After four and-a-half long, arduous years the game kickstarted back in 2014 to the tune of $266,670 from 5,200 backers is finally complete. La-Mulana 2 may be a “Metroidvania” like other side-scrolling exploration series such as Castlevania and Metroid, but in a unique twist it has a strong emphasis on solving cunning puzzles through various cryptic hints. Civilizations that lived in La-Mulana used the Eg-Lana ruins as a penal colony. There, a world vaster than you can imagine, and stocked with diverse locations, awaits you. Explore these mystery-riddled ruins leaving no stone unturned, and learn what secrets they hide. Solve intricate mysteries with hints gleaned from tablets dotted around the ruins, and your adventurer’s intuition: everything from changes to the scenery, distant sounds, the strength of enemies, and the deadliness of traps are hints to the attentive. Bloodied walls and scattered bones are proof positive a trap lies in wait. Enemies will stand in your way at every turn, and neither the bosses, nor the regular grunts will go down without a fight. Watch their behavior carefully, discern their weaknesses and, above all else, never give up. A true sense of accomplishment will be yours for the taking. It’s been five years since a lone archaeologist exposed the truth behind the La-Mulana ruins, said to have been the origin of all civilizations. The extensive collapse of the ruins hampered investigations into the aftermath didn’t stop the nearby villagers from turning the area ruins’ maw into a tourist spot. The 7th Children who had guarded the ruins since ancient times were embarking on a new way of life when monsters began emerging from the ruins’ depths. The Mother that gave rise to these monsters had been completely neutralized, so how was this possible? The village chief reached out to the father-son team that had investigated La-Mulana, but the pair was keeping a low-profile after having destroyed the ruins in the first place. Instead, Lumisa Kosugi, the archaeologist’s daughter answered the call. The Eg-Lana ruins, a counterpart to La-Mulana that had long been used as a penal colony by civilizations cradled in the ruins, brims with “hostility”, “hatred”, and “rage”... Does Lumisa truly stand a chance of solving the mysteries of the Eg-Lana ruins?